I am having a flea beetle explosion right now in my garden. They are particularly bad on my bush beans, squash and cucumbers. I really hate to use any poison right now but they are really starting to damage to foliage and I fear they will lead to foliage diseases. This is only the second time I have ever seen them this bad. I just planted my 3 eggplant seedlings yesterday and I usually have flea beetle problems on them so I saved some coffee grounds and will be spreading them today. I tried this 2 years ago and it seemed to work. I sprinkled the grounds all over the plants and the soil around them. I will know in a day or two if it is working because the flea beetles ALWAYS find my eggplants. If this does not work my second plan is to sprinkle them with DE dust and see if that works. I have never had them bother any crops other than eggplant. Flea beetles decimate the bottom leaves of all of my tomatoes in the ground. I will be trying Surround WP this year to alleviate my stress. No flea beetles here yet, but the buffalo gnats, ticks and chiggers here are horrible. I've got lumps all over me from the bites, my dogs have had lots of ticks. I literally have to wear a face mask in the garden in the afternoon. Flea beetles have totally destroyed the Hinona kabu turnips (they look like long thin carrots) and are starting on the Purple Tops. At least I know that Hinona are a great catch crop. The only thing I found that deals with them is pyrethrum spray. Spraying on both sides and tops of the plants as well as the soil or mulch around them works pretty good. I finally gave up and sprayed them yesterday afternoon with soapy water and Permethrin. I did this the last time they got this bad. They were really making a mess of my beans and the leaves on my cucumbers and squash were a mess. Hopefully that will thin them down to a more normal population and I got a herd of baby squash bugs that were roaming one of my squash leaves. Good for you Bill. I hope it beats them back, kill 'em all. I had them all over the lower leaves of my tomatoes for a week or so. Ordered a bag of food grade diatomaceous earth on amazon and a little air puffer applicator. Havent had any issues since. Works great for slugs too. Just have to reapply every once in a while after rain washes it away. DE doesn't work well on slugs for me. I have been trying it for years on lettuce and cabbage with little to no results. I even covered the ground a half inch deep around my cabbage seedlings with a mix of regular DE and some fine food grade DE and kept applying it right up til time to harvest them. The slugs must have just crawled through it because there were lots of slugs when it came time to pick the cabbage. The only thing I have found that works at all is one of the slug baits applied frequently. I don't like using DE for a minor pest because it just keeps on working and kills good insects just as effectively as the bad ones. It may be organic but it is deadly and that is why I use it on spider mites, stink bugs and leaf footed bugs. Flea beetles can be a huge pest on brassicas here. I hadn't heard about coffee grounds but will definitely try it if I see any damage this year. Yet another use for coffee grounds? It's a week since I posted this. 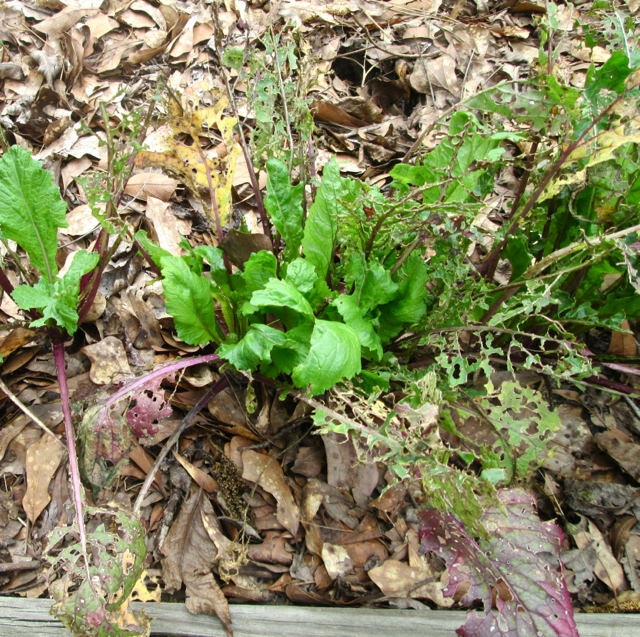 Yesterday I noticed that since I sprayed the permethrin that day (not the pyrethrum), the turnips have pushed out new foliage amidst the eaten up foliage! The flea beetles are gone. I went down the row and cut off all the nasty foliage and it looks like a brand new bed. Hooray! Dealing with these pests is difficult. Good to know someone won the war! I normally have the little rascals really bad on my eggplants by now, but checking this morning I couldn't find any. Whatever the reason I am glad they are missing. I have had a large mole/moles tunneling in the garden for some time, but this morning I found a rather large one that my cat must have caught. It has been trying for a long time. Oh happy day!. I never had them until I planted radishes a few years ago - they showed up in droves and even though I gave up on radishes, the flea beetles are still around. Most of my plants looked a little ratty until they got big enough that the flea beetles couldn't reach the leaves anymore. I don't know if the coffee grounds are working or if I am just lucky but so far my 3 eggplants are untouched by flea beetles and I ALWAYS have them on my eggplants. I just re-applied some used grounds all around the plants tonight.